As a parent who lost a child to a vaccine-preventable disease, I share my story as often as I can to help others learn about the importance of immunization. In my role as president of the National Meningitis Association, I also attend health and medical conferences to encourage healthcare professionals to take an active role in increasing adolescent vaccination efforts in their practices. Often at these events, a physician, nurse or other healthcare professional will tell me that they saw a case of meningococcal disease as many as 20-30 years ago. They say the infection was so devastating that they will never forget how important it is to prevent it through vaccination. But they worry that, because meningococcal disease is rare, colleagues who have never seen a case will be less attentive to ensuring adolescent patients are vaccinated. Recently, an article by Dr. Kristie Rivers reminded me of these stories. The routine childhood immunization program has become so successful in the U.S. that once common, deadly or disabling diseases are now so rare that healthcare professionals may have a hard time recognizing them. Unfortunately with the decline in parents who choose to fully vaccinate their children, these illnesses are making a resurgence—a change that Dr. Rivers has witnessed in her 10 years as a practicing pediatrician. I hope you take a moment to read her perspective and share this informative article with any healthcare professionals that you know as well as parents. Together we can help make sure more all of our children get all of the protection available to them today. Last month the CDC shared some good and bad news. While more U.S. teens are receiving their first dose of meningococcal vaccine than ever before (77.8%, up from 74% in 2012), only 29.6% also received the recommended booster. The booster dose is recommended for all teens at age 16 because the protection they received from the first dose begins to wear off over time. It’s critical that kids receive the booster before they head off to college, where irregular sleep schedules, dorm life and crowded social events can challenge their immune system and put them at greater risk for meningitis. I lost my son Evan to meningitis when he was a 20-year-old college junior. When Evan left for college, meningococcal vaccination was not routinely recommended or readily available. I had no idea that adolescents were at risk for meningitis or that it was potentially preventable. Now, every parent has a chance to help protect their child by making sure their teen is fully vaccinated before leaving for campus. Every parent and college student should also become familiar with the symptoms of meningitis. While vaccination offers the best chance of protection, it is not 100 percent effective, and there are some strains of the infection that are not covered by currently available vaccines. If you’re helping a teen or young adult prepare to leave for school, it can be easy to forget things. 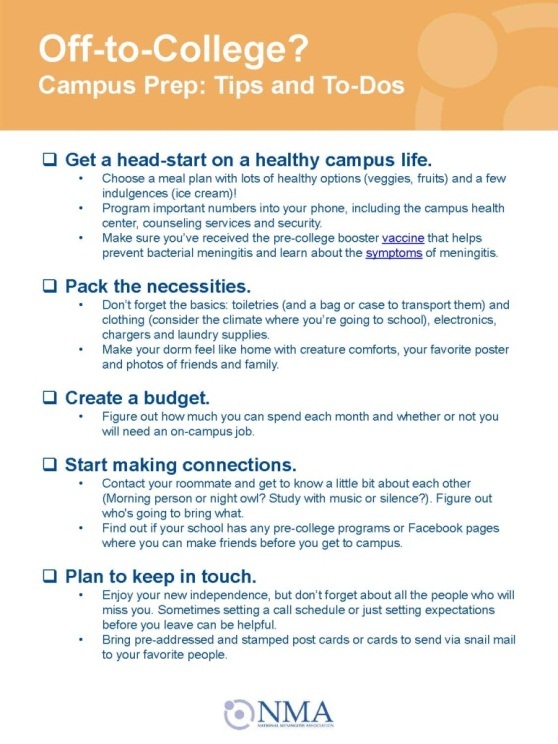 The National Meningitis Association created this checklist of important reminders to help both you and your teen. Please use and share this resource with the college-bound students in your life. And please don’t forget the pre-college meningitis booster!